The Royal Air Force, Fleet Air Arm and the Army Air Corps have shrunk dramatically over the last decade, but the recent Strategic Defense and Security Review has ordered the UK begin to reinvest heavily into its air arms. 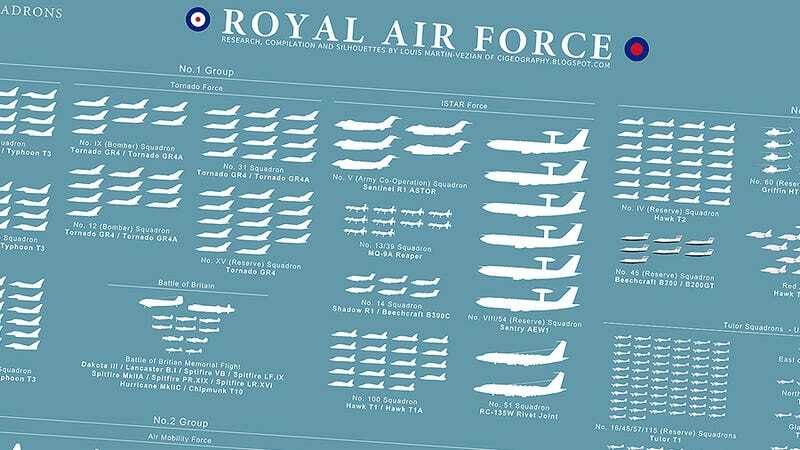 Our good friends from Contemporary Issues and Geography have made this awesome graphic showing all the aircraft and units of the UK’s air arms as they stand today. Check out the full high resolution graphic at CIGs site by clicking here, oh and they are selling these as posters now so pick one up! Seeing these inventory numbers visualized brings a whole new perspective when it comes to evaluating a country’s air combat capability. Of particular note in this case is just how small the UK’s front-line fighter force is. This small fleet seems out of balance with the UK’s capable and fairly numerous information, surveillance, target and reconnaissance fleet of aircraft. Even the Army Air Corps helicopter transport fleet looks particularly small, although it is pretty hard to fairly judge it after seeing how massive the U.S. Army’s chopper force is.